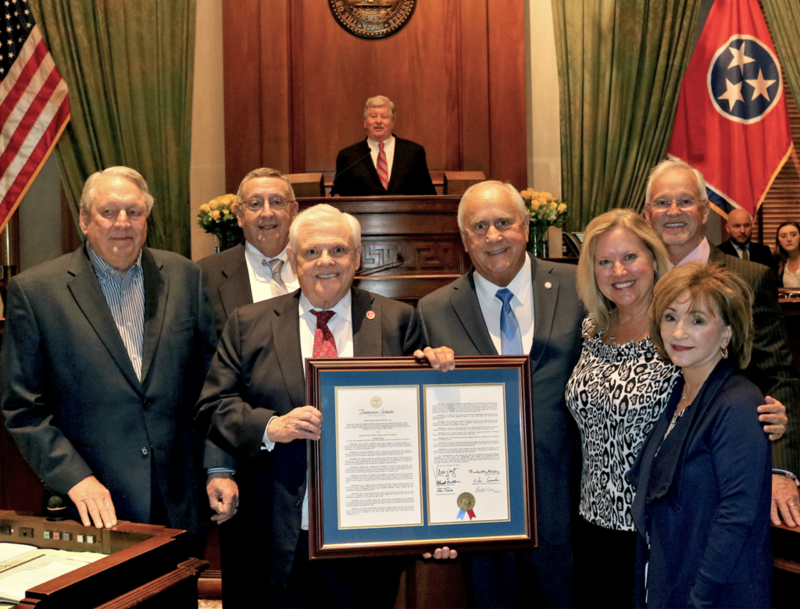 (NASHVILLE) – On Monday night Senator Ken Yager (R-Kingston) along with the Tennessee Senate honored former Deputy Governor Jim Henry, a Roane County native, with a resolution for his exemplary public service to his local community and the state of Tennessee. Prior to serving as Deputy Governor to Governor Bill Haslam, Jim Henry served as Commissioner for both the Department of Intellectual and Developmental Disabilities and the Department of Children’s Services. He also represented the 32nd House District from 1979 to 1990 and served as the House Minority Leader from 1981 to 1986. Henry was first drawn to public service in 1971, where he served as a member of the Kingston City Council until 1973 and then served as mayor until 1978. “It is said that the measure of a man’s life in not its duration, but its donation. During his long career in public service Jim Henry has made a considerable donation to the well-being of this state,” added Yager. The Senate Resolution was co-sponsored by Representative Kent Calfee (R-Kingston) and Representative Ron Travis (R-Dayton). See photo attached of Senator Ken Yager (R-Kingston) presenting Jim Henry with a resolution on the Senate floor to honor his exemplary public service. From left to right: David Johnson (Henry’s brother-in-law), Representative Kent Calfee (R-Kingston), Senator Ken Yager (R-Kingston), Jim Henry, Jeannie Henry (wife), Representative Ron Travis (R-Dayton), and Janet Johnson (Henry’s sister).